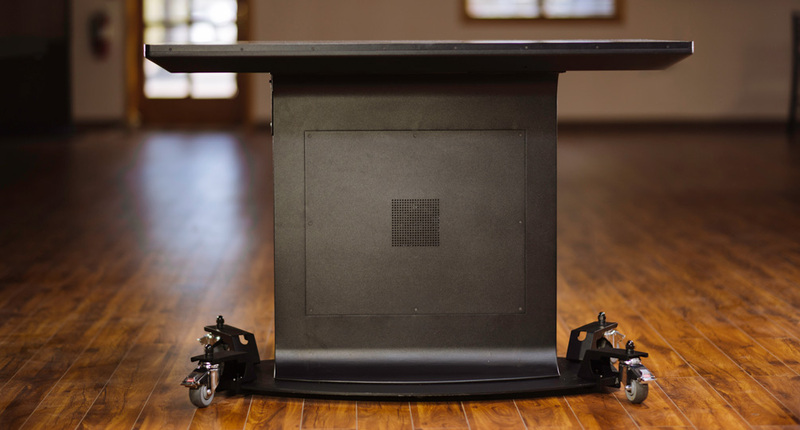 Ideum's large format touch tables can display a large amount of content, support a high level of interaction, and accommodate a group of people for a social experience. 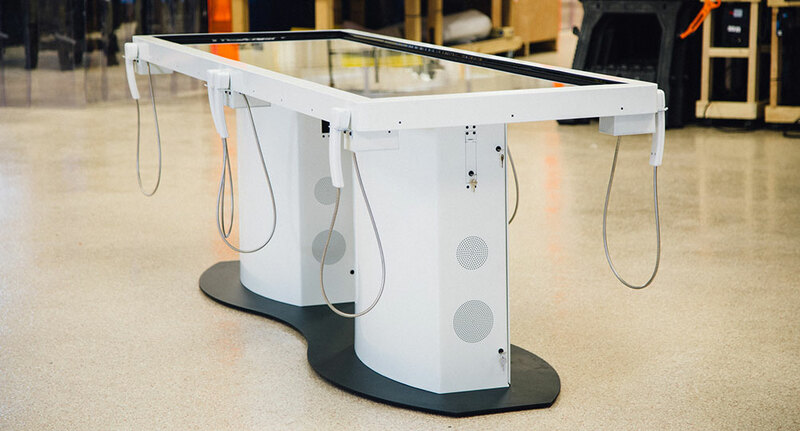 Ideum builds two of the world’s largest production-made multitouch tables: the Pano and the Colossus. Both tables have been installed in high-traffic, well-known museums and organizations. Both are incredibly rugged and built to last. And both lead to very social interactive experiences. But each table’s form factor makes it ideal for specific applications. The Pano has a 100″ long screen and up to 40 touch points, so 8 people can comfortably interact with the Pano simultaneously. It is available with either 2 HD screens or 2 4K UHD screens – which come together to create a unique 8K experience. The Pano is equipped with a powerful workstation perfect for museum exhibits, visualizations, simulations, and other processor-intensive tasks. 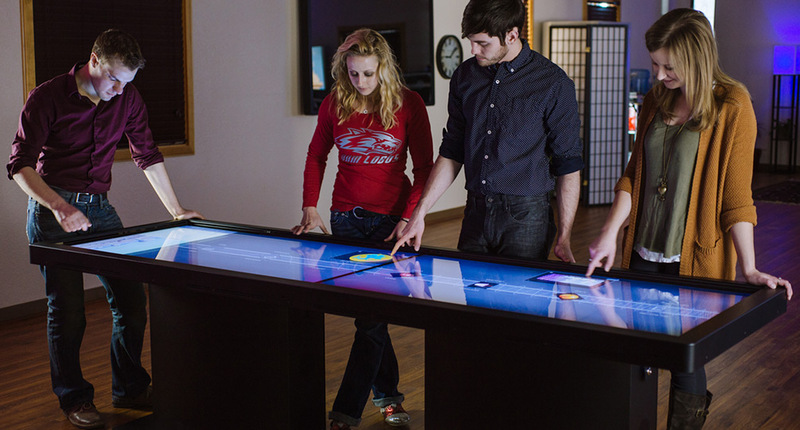 The Colossus is an 84” 4K UHD multitouch table designed for busy public spaces. Its bezel-free glass top is impervious to interference from light and supports up to 100 touch points for multiuser interaction. The Colossus uses projected-capacitive touch, the same touch technology used in popular tablets and smartphones. The Pano has been installed at the Telus World of Science in Vancouver, where it currently displays an Ideum-developed exhibit about the electromagnetic spectrum. Panos have also been installed at the Virginia Aquarium and Marine Science Center, Liberty Science Center, and the University of Pennsylvania, as well as several other museums, visitor centers, and universities throughout the world. The Colossus has made an impressive debut, with its first several installations all being in Smithsonian museums. The first Colossi were installed at the Cooper Hewitt, the Smithsonian Design Museum in New York City. The next installation for the Colossus was in the Smithsonian National Museum of the American Indian, where it has become a hub of The Great Inka Road: Engineering an Empire exhibit. That table features the Ideum-developed Cusco Experience, a 3D model of the Inka capital that incorporates a variety of media. The next stop for Colossus will be at the Smithsonian Air & Space Museum next month, where it will feature an Ideum-built experience in which visitors will design modules for an international space station. Which table is best for your future project? Both tables can display a large amount of content, support a high level of interaction, and accommodate a group of people for a social experience. The long, linear form of the Pano makes it ideal for viewing change over time, as in the EM Spectrum exhibit or other timeline-based applications. The Pano is also great for paired interaction, since one user can easily pass content from one side of the narrow table to the other. And for getting your visitors moving, kinetic activities that require dragging objects the length of the long table are an ideal solution. The form of the Colossus is great for displaying spatial relation-based content like maps and 3D models, as in the Smithsonian NMAI Cusco Experience exhibit. The Colossus is also ideal for creating multiple individual stations around a central unifying image, such as the upcoming Air & Space Museum exhibit will include. We’ll share more about that project next month!